This cracked me up. Bush walks into building. Secret service follows Bush. Guards stop secret service. Bush keeps walking. Bush starts posing for photo shoot. Bush realizes what happened. Bush walks back to guards. 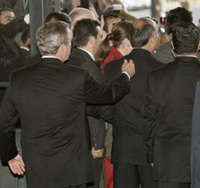 Bush reaches over guards, grabs secret service guy, and pulls him through. note: secret service has never knocked on my door, but if they would like to, please call first as I have no doorbell, and a tendency to sleep through people’s knocks on the front door. Thanks! "Bush “Saves” His Buddy" by Jeremy Felt, unless otherwise expressly stated, is licensed under a CC BY-SA 4.0 International License. Next: The next order of bullshizness….